I am a big believer of 'homemade'. I start from scratch as much as I can. I by no means claim to be a professional in any degree, I enjoy the learning process and am always looking for a new thing to try! 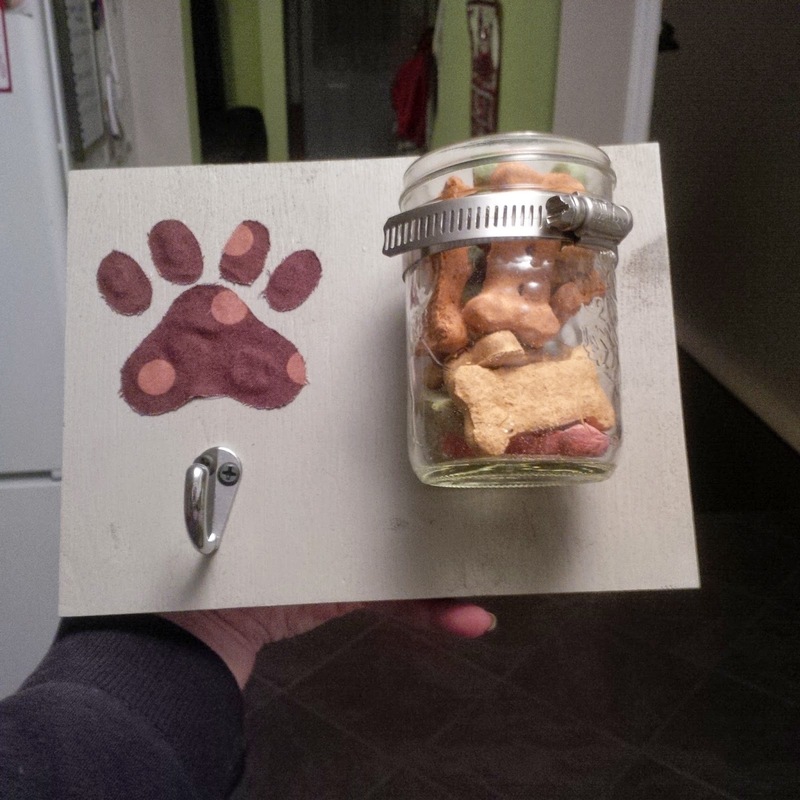 As a leash and treat holder, I thought it would make a great Christmas gift for a dog lover! I found a scrap piece of wood from a prior shelf building project and painted a light coat of grey left over from our bathroom reno. After the pain dried I wiped it with some dark stain. You can't really tell from the picture, but it gave it a nice rustic/country look. I happened to have some brown material left over from another Christmas gift so I cut out a paw print and using hot glue, attached it to the board. I found a hook and the 'o' clamp at our local Home- Depot for a very low cost. The screws that came with the hook were a little too long so I looked around in my husbands tool room and found some smaller self-drilling framing screws. They were very easy to screw into the wood with just my kitchen screwdriver. I got my husband to attached the 'o' clamp as I was having trouble getting the screws through the tiny slits. He then tightened it up with the jar inside and voila! I added some picture hanging hooks on the back so I can be easily hung on the wall. Overall this was a very easy and relatively inexpensive homemade gift. I liked it so much that I'm making one for myself!